Comprised of approximately 60 islands and islets that are nestled relatively close together, most are well within the range of daily dive boats. The BVI is host to a number of dive operators that offer everything from the typical morning, afternoon & night excursions, to rendezvous diving, and gear rental & services that cater specifically to the needs of those sailors who also enjoy exploring the underwater world of the British Virgin Islands. There are many land based resorts as well as one or two liveaboard dive boats that provide great dive opportunities in the BVI. After leading 16 dive groups to the BVI over the years, I still appreciate the amazing variety of underwater topography that the BVI offers, and in fact, that wonderful diversity of underwater experiences is exactly keeps me going back! From reefs, walls, ledges, sea mounts & outcroppings, to some fascinating shipwrecks (including the well-known RMS Rhone which sank in 1867 and is arguably the signature wreck of the Caribbean), the BVI has much to offer and has become a worthy diving destination with many regular visitors from both the USA and Europe. Those that are familiar with the US Virgin Islands will find a remarkable difference and change of pace once they cross over to the British side. Life in the BVI tends to be much more relaxed, low key and enjoyable….especially after you’ve enjoyed your first “Pain Killer” or “Dark & Stormy” along with a West Indian Roti……to this day there are no “fast food” restaurants in the BVI. There are approximately 80 marked dive sites in the waters of the British Virgin Islands and the National Parks Trust has placed permanent mooring balls on them to avoid anchor damage to the precious reefs. If diving on your own rather than with one of the local dive operators, I recommend that you do a little additional research so that you fully understand the protocol when using the various types of mooring balls. There really isn’t much shore diving opportunity in the BVI so one way or the other, you’ll be diving from a boat. While Tortola is by far the largest island in the archipelago, it doesn’t really offer many dive sites, so most of your dive adventures will take place around the other wonderful islands in the chain. As mentioned previously, the majority are all an easy boat ride away. That is actually one of the best features of diving in the BVI. Instead of diving just one island for a week, you are actually able to dive and enjoy a whole chain of islands….variety, variety, variety! While many of the sites are well protected from wind and waves, some of the best underwater experiences I’ve had have come from diving on the more “exposed” sites when the conditions allowed. These sites are often in the gap between two nearby islands and can sometimes be subject to a bit of current & waves, so it generally pays to dive with the local operators who have the knowledge and experience to best judge the appropriateness of the weather & conditions. But when things are right, all I can say is wow! 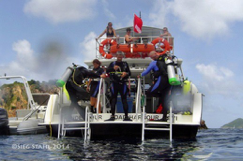 The BVI is not known as a deep diving destination so it is a great choice for divers of all levels of experience. The depth for most dive sites ranges from about 30 to 85 feet, although you might need to bring a shovel to hit 85 feet. The British Virgin Islands are home to a nice variety of typical Caribbean marine life and an occasional surprise visitor, but no matter where you travel, it always makes sense to do a little homework to understand what fish and marine creatures you might encounter and which might be potentially harmful to you if you come in contact. As always, the best thing you can do for yourself is to develop good buoyancy skills and have a “look - don’t touch” mindset. "The Guide to Diving & Snorkeling in the British Virgin Islands"